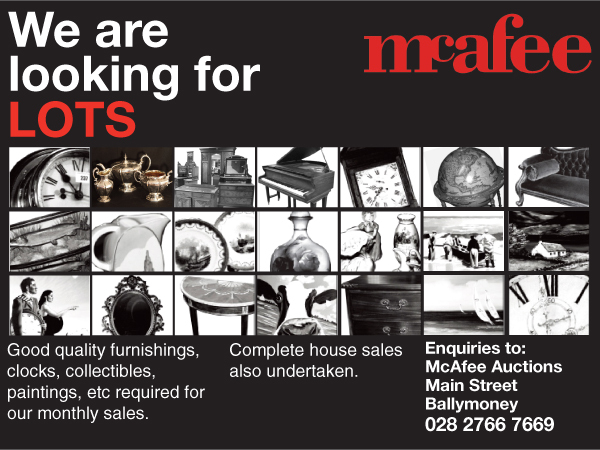 While many sales are held on owners' premises McAfee Auctions hold regular sales of antique and general furnishings and fine art sales in their own Auction Rooms in Ballymoney, Ballycastle and Loughgall Co. Armagh. Under the personal supervision of Gerard McAfee M.R.I.C.S, F.N.A.V.A, F.N.A.E.A. each sale is widely advertised, itemised and catalogued, afforded ample time for viewing and brought to a satisfactory conclusion. McAfee Auctions as well as handling full house clearance sales, on or off the vendor's premises are also in position to arrange collection of surplus furnishings direct from your home to the auction rooms. From small specialist sales ranging from just 100 lots to a large clearence sale of over 1000 plus lots, McAfee Auctions have the expertise to handle any instruction.